Giving an eye exam to a screaming 2 year old with zero attention span may be the least exciting part of your optometric day. But I am here to offer you my quick and easy guide to making the most of the 5-10 minutes of information retrieving you may be at the luxury of obtaining. Here's my quick and easy guide to making the most of your toddler or challenging pediatric exams. I tell my technicians when I see a young toddler on the schedule that if they don't get any single piece of information before the patient sees me, at least talk to the parent about what, if any problems they have noticed at home. Your patient's parent has been looking at their child's eyes for years, and they will have noticed unusual behaviors like eye turns, or frequent eye rubbing. If the parent doesn't know, ask about preschool teachers or daycare providers. Have they said anything about the patient's eyesight or behavior? I like to start by making my examination seem more like playing a game. "Can you follow this pen/stuffed animal/interesting object?" Games are engaging to children and will grab their attention as a first task. You can very accurately get a good feel for EOMs with this method. I will also push the target in towards their nose --"can you follow it towards your nose?!" and I just got a push up convergence reading. Cover testing can be a real challenge, but I have had success with a "staring contest" method. "Have you ever played a staring contest? Look right at the tip of this pen/animal's nose/etc and I am going to try to distract you, but don't take your eyes off it!" Sometimes as I use my hands or an occluder to cover and uncover the eyes, the child will be too distracted, and this method will fail. No worries, you always can fall back on Hirschberg. Remember, for every millimeter of decentration in the light reflex, that is 22 prism diopters of misalignment!! If you just did Hirschberg, this is an easy transition. You already have a light in hand to check pupils. My advice, get in and get out fast. Children don't love lights being directly shone in their face. I will often have my direct out for Hirschberg, do a quick pupil testing, and then end with Bruckner's to help me prepare for retinoscopy. Bruckner's test take home: If one eye is brighter/lighter then it is either deviated (strabismic) or amblyopic in some way. Darker red reflex is normal. Brighter is Bad. That's right, I don't start with vision. I find that usually checking vision is not fun for patients, and they get bored reeeaaally fast. How much technical information you can get really depends on the age of your patient and their level of cooperation. Maybe they can read a few pictures for you. Maybe they know A, B or C. Tumbling E chart is also an option if they are ready to cooperate. I find that usually in 2-5 year olds, I can get relatively good results with a picture chart using the cake, chicken, hand print, and plane characters. Good luck on that telephone and car. But you may get inventive responses if you want a good laugh. 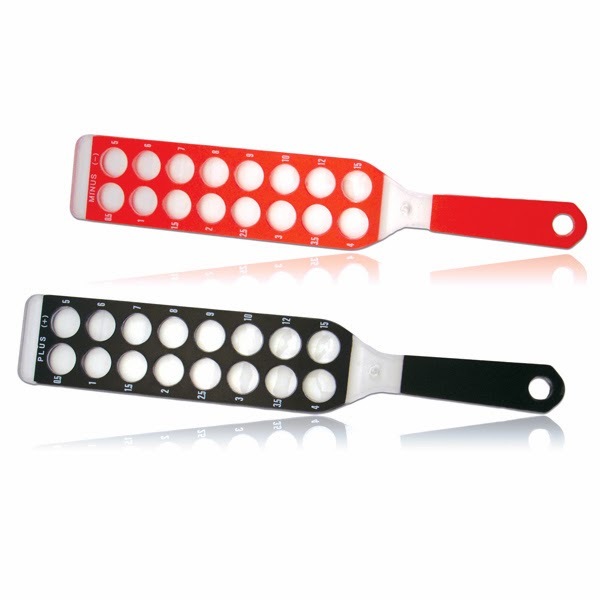 In infants, having Face Dot paddles are a great tool. But if you don't have that luxury, just getting the patient to respond to any visual stimuli -- a stuffed animal, a colored block. Anything is better than nothing. I like hiding a toy behind a piece of paper, and then bringing it out from behind. Infants will find a toy much more fascinating to look at than a blank paper. If they can see it of course. Many times they will just look at your face the entire time, but that is useful too. If they smile when you smile and make faces, this is also a measurement of vision! This is really the bread and butter of your exam. There is a good chance after retinoscopy that you are going to get zero other useful data. But you really need to have this. I like performing retinoscopy prior to dilation, but if it is just not happening, go ahead and skip to cycloplegic insertion and take a 30 minute break. Sure it is ideal to have the patient look at a target on the wall, but that is usually not going to happen. It is so much more interesting for kids to look right at your light. What's the solution? Mohindra of course. Turn the lights down dark, and just let the patient look at you. I love my skiascopy bars for this; good luck if you are in the phoropter for a two or three year old!! Now remember, the patient is fixating on you, so you need to take that into consideration when you determine the actual Rx. The rule of thumb is take your reading, and adjust -1.25D from that for your final Rx. Why? Dr. Mohindra was a brilliant and very petite female doctor. She had short arms, and a small working distance for her retinoscopy as a result. So if she used a 40 centimeter distance to scope (+2.00D), and the patient was fixating on her scope, if the patient has a normal accomodative lag of +0.75 D then you should adjust the Rx by -1.25D. Follow me? (thank you Dr. Alan Fors for these entertaining optometry histories). If you didn't fully follow my poor attempt at explaining Mohindra's magical 1.25D adjustment, just remember that is a rule of thumb, but would not be accurate if you scope at other than 40 cm. If you have long arms, don't adjust -1.25D. Adjust your Rx according to your normal retinoscopy adjustment with that 0.75 near lag taken into account. Yes, it is nice to get a near retinoscopy here too. But be practical. Getting something is better than nothing, and you will able to tell very quickly how much cooperation is occurring on the other side. If you cyclo, you also need to take into account the change in Rx from the accomodative system being entirely knocked out. As a rule of thumb, many doctors suggest cutting about 1.00D from hyperopic Rxes after cyclo and adding -0.50D to myopic Rxes after cyclo. Example: If you scope a +5.00D with cyclo, prescribe a +4.00D. If you scope a -3.00D, prescribe a -3.50D. If you can get your young pediatric patient into a slit lamp, well you just may be a magician. I find that a transilluminator or direct scope with a 20D lens is usually quite effective. You can see large corneal scars, conjunctival growths, and even papillary reactions under the eyelids quite easily. And kids are sometimes interested enough to try to look through that big magnifying glass to hold still for a few seconds. This is also a good time to do a digital IOP measurement if you weren't able to get NCT in a work-up. Just palpate gently through a closed eyelid to test for symmetry. Even with dilation, evaluating the internal eye is difficult. Sometimes the best I can get is a red reflex confirmation -- but that is something. Really the important thing to find here are developmental defects like coloboma, or ocular tumors that will be quite obvious (white instead of a red reflex). If you can't perfectly grade that C/D ratio, there is always next year. I know this is not the ideal exam that I just wrote about, but this is the practical way I collect data and if needed, prescribe glasses for my very young or very uncooperative infant and toddler exams. Just simplify your testing, maximize your short amount of time where the patient pays attention to you, and don't be afraid to abort if a particular test isn't working. Inventiveness and flexibility is so important with kids. The rapport you build with your young pediatric patient in toddler years is going to make those elementary age exams so much easier, because you will have established the eye doctor as a fun and not scary place to be. And if a toddler or infant is really having problems with ocular development, you will have found the problem before it can interfere with learning to read and write. Take the time to do these exams, because perfection isn't required. Just get the best results you can from what the child allows, and even with the most imperfect five minutes of testing, you would still be able to find life-threatening or vision-threatening problems because that is what all of those years of optometric training prepared you for!